People seem more interested in Berserk's prepublication schedule than ever, so I figured I might as well share this resource I made for myself some years ago. I'll update it from time to time. Wow this is really awesome and comprehensive! 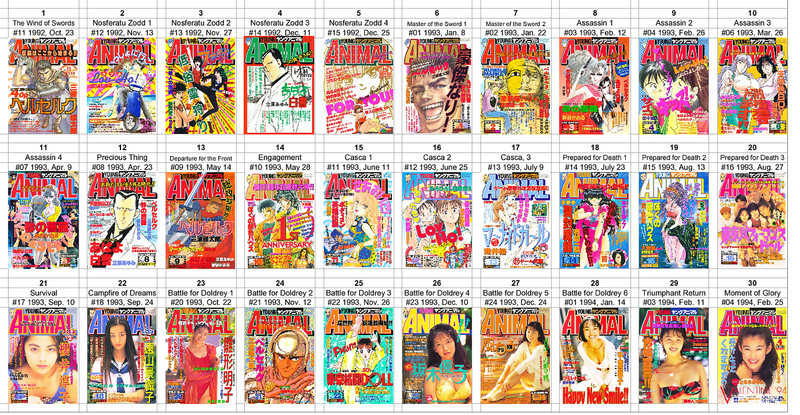 So interesting to have this complete listing of all Miura's publication history in Animal House/Young Animal. Just a question of clarification, Young Animal's 01 issue of the printed year hit the stands during the second Friday of the December of the year before, right? Also out of curiosity, was Revenge 16: Golden Age (#8) never published in Animal House? Was it added in Volume 5's publication? Oooh, that's nifty! I need that to help me keep track of my YA collection. That's why I originally made it. Yeah, the cover date is always ahead of the actual release date by one increment. Good question. I forgot to be honest. I would need to check, but as you can imagine information dating back from that era is hard to come by. Man, that's an exaustive list! Thx for sharing that Aaz. It's always interesting to me to see the progression. Thanks for sharing this, Aaz! It's extremely convenient. I was using this but I find it a bit annoying to navigate and some episodes are listed with the wrong issue. So now I'm working on this to use for quick reference. Says that it was published in the March 1992 issue.